More than 50,000 fans are expected to converge in northern Michigan’s AuSable River Valley for one of the state’s most iconic sporting events: The 70th edition of The AuSable River Canoe Marathon, presented by Consumers Energy, widely recognized as one of the greatest canoe races on Earth. 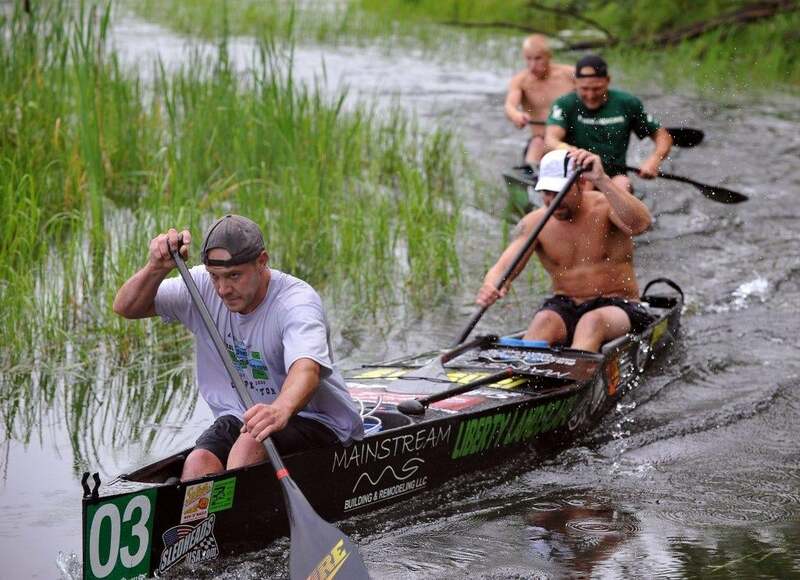 At least eighty (80) two-person teams – including participants from Australia, Belize and seventeen (17) U.S. states and Canadian provinces – will compete in the 120-mile non-stop overnight race on northern Michigan’s fabled AuSable River. They will paddle at an amazing rate of 50-80 paddle strokes per minute for 14 to 19 hours in sleek and stealthy hi-tech carbon-fiber racing canoes that weigh less than 30 pounds, many costing $5,000 or more. The teams battle the darkness, river obstructions, frequently adverse weather conditions and sheer exhaustion during the 120-mile race that includes running portages around six Consumers Energy hydro dams. At locations along the way they receive food, drink, clothing changes and other support from “feeders”, or pit crews. The top teams vie for a share of the $50,000 cash & prizes purse. Thousands of fans follow the action following the frenzied LeMans-style running start to the river that begins the race in Grayling at 9:00 p.m., Saturday, July 29. Many fans move on to viewing locations at bridges, public access points and dam portages to cheer on the teams throughout the race to the finish line in Oscoda on Sunday morning, July 30. Thousands of other fans encourage the competitors from riverfront cabins and homes, many being the site of Marathon parties where family and friends gather to catch a glimpse of the action. Canoe racing action gets underway at the $5,000 Consumers Energy Dash For Cash, staged at the AuSable Finish Line Park in Oscoda beginning at 5:30 p.m. Tuesday, July 25. The Dash is a single-elimination “canoe-drag-race” event with the teams sprinting 1/4 mile two-at-a-time, producing an exciting evening of racing and some thrilling photo finishes. Next up are the Time Trial Sprints, Wednesday through Friday afternoon, July 26-28 at Penrod’s Resort in Grayling. Similar to Sprint Cup or Indy Car qualifying, teams individually sprint a looped course upstream to a buoy in the center of town to score a time that determines their starting position for Saturday night’s run to the river with their canoes that starts the AuSable Marathon. The main event pre-race program kicks off at 6:00 p.m. Saturday, July 29, in Grayling. The race gets underway with the running start to the river signaled by the crack of the starter’s pistol at 9:00 p.m. sharp. Thousands of fans will cheer on the racers throughout the night in into the afternoon on Sunday, July 29. The leaders are expected to arrive at the finish line in Oscoda close to 11:00 a.m.; teams must finish within 19 hours (by 4:00 p.m.) to be considered an official finisher.